When you’re the gold medal champion from the Parapan Games, the bar is raised and so are expectations. It’s raised even higher when you’ve made the podium at the World Championships. Along with those lofty expectations comes added pressure to do well, but athlete Jessica Lewis can handle it. Lewis — along with boccia player Yushae DeSilva-Andrade – will represent Bermuda at the Rio Paralympics, which start on Wednesday, September 8 and run through September 18. Lewis, who competed in London, will race in the T53 100m, 400m, and 800m. She told Bernews, “Going to Rio I feel more prepared because I have a better understanding of what to expect at that level of competition for example the crowds and my competition. She has been working on her starts which will help her with her best event, the 100m. Lewis won the gold last year in Toronto in the 100m at the Parapan Games and a bronze at the World Championships. She has set a goal of reaching the finals in all of her events. “This will be challenging to do in the 400m and 800m as those aren’t my strongest yet, but I am definitely up for that challenge. Lewis admits: “Pretty much the whole race has to go right to end up on the podium. I’m one of the smallest competitors size wise but I have a really good start so I’ll need to have that starting speed to help me get ahead of my competitors which will hopefully hold them off through the finish where they are stronger. “I definitely do feel pressure to medal because 2015 was a break out year for me by medalling at Parapan Am and World’s so I feel there is an expectation to medal in Rio,” she said. 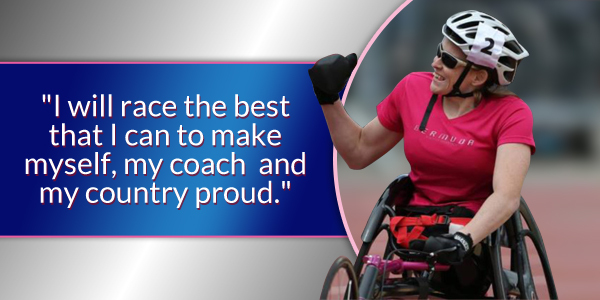 “I will race the best that I can to make myself, my coach and my country proud and regardless of the result I can come away from Rio smiling as I can call myself a two-time Paralympian. She added: “I am extremely proud to represent Bermuda because the amount of support I have been receiving from the people of Bermuda has been amazing – Bermuda Paralympic Association, WindReach Bermuda and my sponsors Tokio Millennium Re. Well done Jessica. Thank you for representing Bermuda and making us proud. Can’t wait to see you perform. All the best Jessy! GO FOR IT JESS ! You are a born winner and we all love you . Thanks to you and all our athletes that represent this tiny country so well. We are proud of all of you.